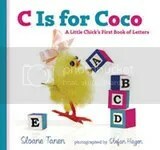 “c is for coco, the very best chick. congratulations to jenn who will soon be reading all about coco! thanks to everyone who entered. check back soon for my next bloggy giveaway.